Today was the first major deadline for this legislative session. Any bill that did not receive a hearing and work session, and subsequently did not move out of committee by today, is considered dead. This, my first session as your State Representative, I Chief Sponsored 40 bills. 27 of these bills have received work sessions and have moved out of committee, or are in a committee not subject to today's deadline (Revenue, Rules or Ways and Means). That makes over 67% of the bills that have made it past this deadline. I am grateful to my Chief of Staff Shelia Megson and my Legislative Director Mark Miller, for all of their amazing work in keeping the legislation and me straight, as I draft amendments and other language through this process. I am also grateful to my committee Chairs and committee Members. We have named District 1, "Southwest Oregon's Fish, Farm and Forestry District, and many of my bills (12) were in the House Committee on Agriculture & Natural Resources. I want to thank Representative Clem, Ag & Nat Comm. Chair, for all of his great work and support. I would also like to thank House Committee on Economic Development & Trade Chair, Representative Lininger, for all of her assistance and support. (I am the Vice Chair of the House Committee on Economic Development & Trade) I also appreciate all of Human Services & Housing Committee Chair, Representative Keny-Guyer for her help and support. I also, and equally important, appreciate the support from my colleagues in committee for all of their great work and support. I am grateful for our bipartisan work on this legislation, and I look forward to our continued work as these bills move through committee to the floor. I also look forward to working with my colleagues in the Senate as they consider my bills in their committees. Lastly, I would like to thank Republican Leader McLane for all of his support & guidance, and Speaker Kotek for her assistance with this legislation. A big thank you to their staff as well, who also offered a great amount of assistance. A complete list of the bills and a description are listed below followed by a break-down of where the bills are in the legislative process. There are hyperlinks to the legislation on the bill number and I would appreciate your support. Modifies purposes for which school districts may receive grants to pay for costs incurred by school districts to purchase food produced or processed in state. Authorizes counties to withhold from taxing districts costs to county of assessing property and collecting property taxes. Specifies that, for purposes of statutes regulating seeds, agricultural hemp seed is flower seed. Establishes Oregon Industrial Hemp Commission. Requires Governor to certify to United States Secretary of Commerce that terms of national marine sanctuary located within seaward boundary of Oregon are unacceptable unless Legislative Assembly confirms designation. Authorizes city or county to adopt ordinance or resolution granting exemption for newly rehabilitated or constructed multiunit rental housing. Establishes process for vessel permit seller to petition for preliminary injunction allowing seller to continue to fish under vessel permit during pendency of proceeding concerning claim that buyer failed to fulfill terms of vessel permit sale. Directs Department of Human Services, in consultation with Department of Justice, to develop and implement training and continuing education curriculum for caseworkers that informs and instructs caseworkers on their roles in juvenile dependency proceedings. Makes form and style changes to statute regarding farm land and golf courses. Authorizes ports to advertise activities of port and activities of others using port facilities. Permits owner of lot or parcel of at least two acres zoned for rural residential uses to construct new single-family dwelling on lot or parcel if owner converts existing historic home to accessory dwelling unit. Requires State Fish and Wildlife Director to, before appointing Oregon Hatchery Research Center Board members, consult with organizations that represent certain interests and take into consideration nominations or recommendations received in course of consultation. 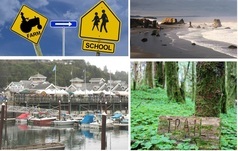 Requires development of plan for Oregon Coast Trail. Allocates $2,100,000 of lottery revenue to Oregon Business Development Department to be used to issue grants or loans in support of redevelopment of Port of Port Orford Cannery. Appropriates moneys to State Forestry Department for 2017-2019 biennium to carry out integrated pest management program to combat Sudden Oak Death. Directs Oregon Business Development Department to issue loans or grants to Curry County to construct training facility for public safety personnel. Establishes Task Force on Use of Surplus Public Lands for Housing. Repeals Department of State Lands leasing requirements for kelp harvesting. Provides grants to certain counties that received Secure Rural Schools Program payments if voters of county approve local option levy or bond levy. Provides that Department of State Lands shall distribute certain moneys that have been in Common School Fund Account for 25 years or more. Makes permissive rather than mandatory provision that noncompliant survey map that is not corrected by surveyor and returned to county surveyor within 30 days be forwarded by county surveyor to State Board of Examiners for Engineering and Land Surveying for action. Authorizes moneys in county road fund to be loaned to taxing district within county only pursuant to legally binding intergovernmental agreement or loan agreement. Celebrates 50th anniversary of Oregon's Beach Bill. Urges President and Congress to pursue Oregon and California Railroad grant land management reforms. Proposes amendment to Oregon Constitution to require two-thirds majority vote in favor in each chamber of Legislative Assembly to pass bills declaring emergency. Authorizes issuance of lottery bonds for purpose of repairing and improving docks, marine infrastructure and facilities owned by Port of Brookings-Harbor. Although we are past this first major hurdle through the process, there is much work still to be done on this legislation. I look forward to working with the Committee Chairs and Members on further refinements if needed of these bills and others, for my residents of House District 1 and the people of Oregon. It is is honor and privilege to work for you as your State Representative. Thank you for the opportunity and Gold Bless.